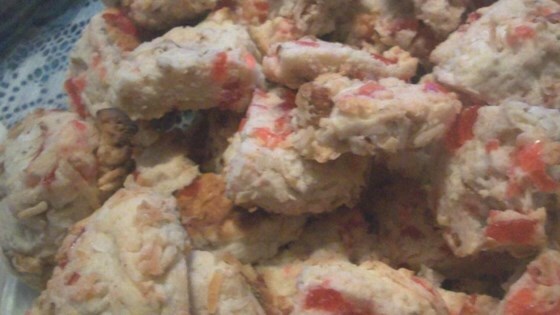 "This recipe was given to me at a Christmas cookie exchange. Try using rum extract in place of the vanilla for extra nippy flavor." See how to make moist, layered cookies loaded with almond flavor. What did I do wrong? I could not make this dough stick together. Would not roll into logs. Just fell apart. Added a little more milk- still would not roll together. I made this with a friend a couple weeks ago, but she uses chopped dried cranberries instead of candied fruit. Absolutely delicious cookies! I love the way these taste, BUT the centers won't bake before the coconut turns very brown. One of my favorite Christmas cookie recipes. The red and green cherries highlight the colors of the Season.